This report, released by the Center for Constitutional Rights and Palestine Legal in September 2015, documents for the first time the widespread and growing suppression of Palestinian human rights advocacy in the United States. Between January 2014 and June 2015, Palestine Legal responded to nearly 300 incidents of suppression; 85% of those incidents targeted students and professors, on a total of more than 65 US college campuses. This trend has significant implications for both the First Amendment and democratic principles like academic freedom, not to mention the mission of higher education to help develop critical thinking. 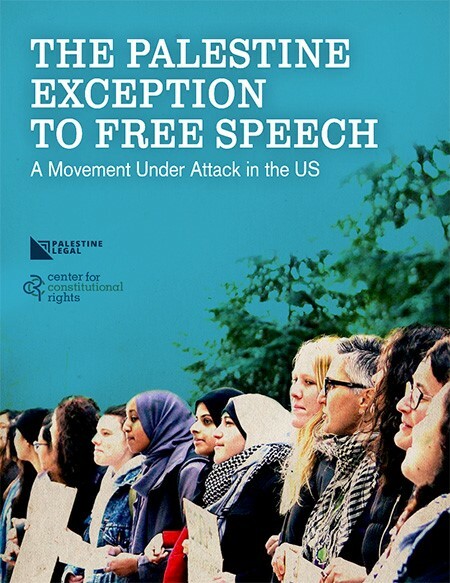 The report outlines the tactics – including event cancellations, baseless legal complaints, administrative disciplinary actions, firings, and false and inflammatory accusations of terrorism and antisemitism – that Israel advocacy organizations, universities, government actors, and other institutions have used against activists. It also contains testimony from advocates who have been targeted for their speech or expression, and includes an appendix documenting more than 50 campus-related case studies.